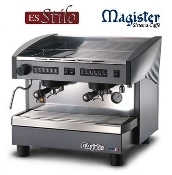 Magister ES 70 Stilo Two Group espresso machine, 230V 2700W. Electronic, automatic coffee machine with programmable dosage. NSF and ETL Certified. • Kit for pods is available. Dimensions: Width 23.9 inch x Depth 21.4 inch x Height 20 inch. ETL Listed, NSF Approved. Ideal for commercial use with high volume business. POD Conversion kit is available. Buy the machine without paying for name of brands. Famous name models are sold at twice the price that is not for any advamtage in quality or service. Machines are sold with one year warranty for parts and repairs. Machine must be connected to water softener . Various sales packages are available. CLICK HERE to watch the video highlighting the features of the new Magister ES Stilo espresso machine. We stock parts for fast after sales service.